Style Details: I wanted to do a "tough meets demure" look with this outfit, as the dress is kind of both in of itself. I wore my favorite leather jacket with my tan Nine West Mary Janes. The jacket is perfect for fall, as is the whole color scheme. 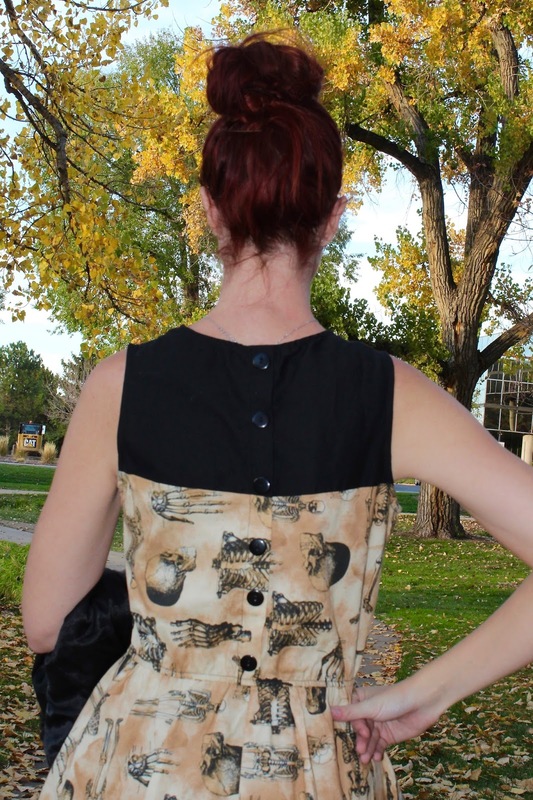 Bonus Details: This dress has buttons down the back, making for a really cute fine detail. But luckily they're decorative and there's a functional side zipper to help you get in and out of the dress. Anyone who's tried to button up dresses while being stuck alone knows what I mean when I initially saw the buttons but ultimately breathed a sigh of relief knowing they weren't instrumental to getting in and out of the dress! I hope everyone had a great weekend and is having an even better Monday! Biking Through Brussels Dress Review-->Cherry Cherry-->Lovely in Lilac Collab!-->I'm Baaaack!! !-->I'm on the Glo Mineral's Blog! Sounds like a great store and I love the dress! Perfect colors for fall with the pretty trees. Hope you're having a great week, Lauren! Wow, I can see the print of this Lovely in lilac dress, it's impressive! Skulls, bones,so nice! I liked the cut, the blazer and what for a nice detail the dress has, with buttons and the first part of the top in another color, not the print. You look very beautiful as usual! Hope you are fine (you mentioned something about health before)! So cute! I really love the back buttons and all the better that they aren't actually functional! Love! Haha your button comment because I've been in that situation before and its a complete nightmare. And it was corset style with tons of little buttons :0 Anyway, haha, I love the skeleton print here! Anoher great dress option if you dont want to dress in costume for Halloween. How fab is that jacket too?! I really need to get a leather jacket at some point here. The leaf background here is making me smile too. Just beautiful.